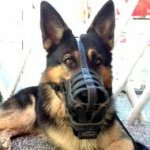 What Are the Most Useful Dog Games for Mental Development and Behavior Correction? 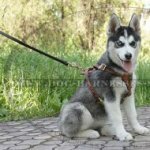 Games for puppies and young dogs development and games for older dogs mental health correction stimulate brainwork, show the style of communication with the owner during playing, help to neutralize anxiety. 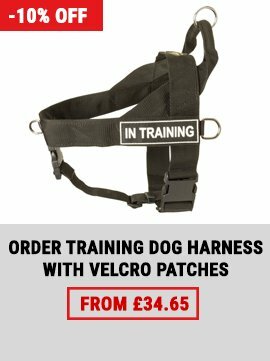 Some dog training games help to reinforce certain behaviour. The other dog games balance CNS. Dog games are the most natural and effective bridge-builders between the dog and its owner. This is particularly so with non-service dogs. All the games have friendly and joyful emotional coloring. The owner shows his or her emotions with laugh and kind voice when plays with the dog. You may play with the dog only when it feels perfectly safe – it's a requirement of natural dogs' behavior. The games are complicated gradually only when the dog has already learned simple variants. This game is based on gestures and the dog's forepaws touching. The efficiency of this method is due to the fact when the dog allows the owner to touch its forepaws. This means the dog trusts him or her. Dog's concentration on the owner's movements is reached and observation skills towards the person are developed with the help of the game. One more positive result is an additional development of spatial orientation. There are two variants of this game for dogs. One of them reminds famous child game when the owner claps the dog's forepaws holding them with the hand slightly. The dog can draw its paws back and even try to touch the owner's hands. The second variant is when the owner clap his or her hands lowly on opposite sides of the dog's head. The dog moves its head towards the owner's hand looking round. This action is praised but the dog is forbidden to bite the hand. "Paws" are used for puppy development since 1.5–2 months. Dogs' analytical thinking is developed by using search dog games. 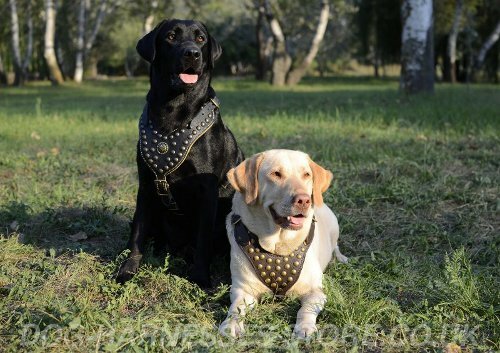 They are perfect partner games by developing relationships between the dog and its owner. Several pieces of healthy dry dog food (no more than six treats) are set out on the floor. One of them is given to the dog to sniff. The owner says the command "Smell". He (she) strokes the dog and repeats the command in the same way as during training. Then the owner throws the piece of treat, the dog has already smelled, there where the others lie. Then "Seek" command is given. Every founded treat is a reward for search efforts. The owner also praises the dog. Help the dog at any difficulty showing where the treat may be. The main task is not in the treat finding, but in gathering all the pieces of treats, which were set out by the owner. This game develops focusing on actions performed and attention holding during the time needed. The quantity of treats is changed at the pleasure of the owner. 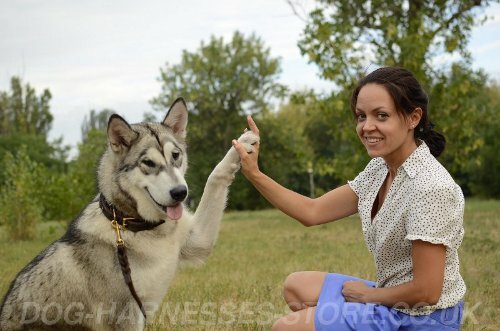 The person gives the treats to the dog on the hand and praises it generously for success. The game is complicated by setting out the treats at longer distance from each other, on the furniture, behind and under things. Next step is to replace treats by several equal subjects, which are not as interesting for the dog as the treats are. You may use bite tugs or a toy with bell inside. 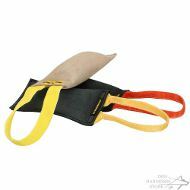 At first stage these tools may be saturated with some flavor, which the dog can identify. It's forbidden to use alcohol-containing substances, perfumes and very attractive odors (of meet, sausage etc.). Celery, fennel, parsley flavors usage is very good. The rules of the game are the same. The dog should find all the subjects hidden in the house. The number of subjects is changed at the owner's will. Hand feeding with treat is the end of the game. Advanced level of this exercise is "Search a territory". Search games are allowed from 3-4 months. Six dummies, which were used before for search game, are indicated by pairs (f.e. with numbers of the same color) and are saturated with three flavors. It will be enough to hold dog bite tug with number 1 in a pouch with fennel for several hours, the pair with number 2 – in a pouch with parsley and a pair with number 3 – in a pouch with celery. All the dummies are set before the dog and one of them is given to smell. 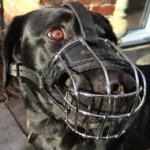 The dog should smell out the pair to the dummy. The task is more difficult the more closer pads lie to each other. The advanced level of the game is when all the dummies are set in a row and the position of the required dummy is changed. Scent games are used from 5 months. You need two-six boxes for this game. The size of each box should be much the same with your dog's head. Make small holes in every box to make the flavor perception easier for the dog. 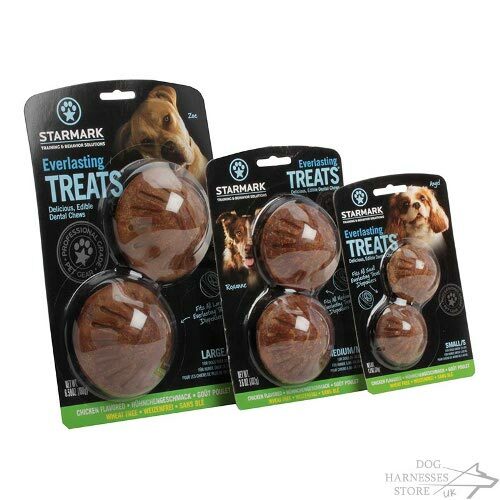 A piece of dog treat with tasty smell is put under one of the boxes. The dog should identify by flavor under which box the tasty treat lies. The position of the boxes and treat is changed at your will. The game is complicated by quantity of boxes increasing and using more than one dog treat. 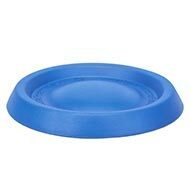 You should help your dog and hand feed it with the treats it was found when the game had been over. This game may be used from 4-5 months. It's a perfect form of search dog games. The dog should identify the subject, which belongs to a certain person by flavor match. Some things are given to several people to hold in hands for a while. One of these things is given to the dog to smell. The dog has to point to the person, which has the same flavor with the subject the dog smelled. 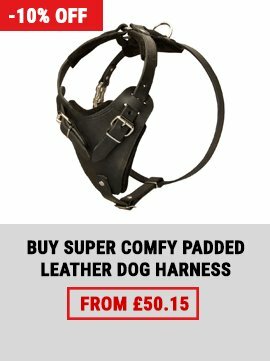 This game is used only for adult dogs, approximately from 12 months. Active games, based on fetch training, develop mobility, quick response and mental processing. 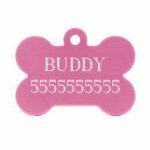 These games are especially good for the dogs with phlegmatic temperament. It's advisable to use fetch dog games when the dog is already six months old and well physically developed. 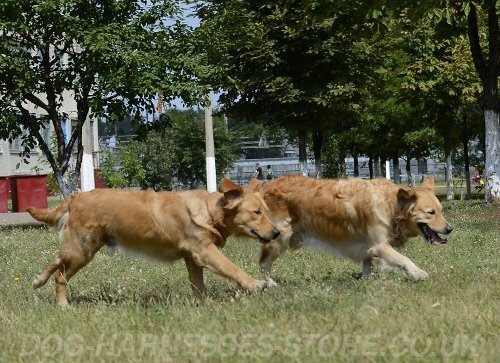 You should notice that fetch games are unsuitable for overexcitable and choleric dogs because they increase CNS excitability providing pulse sequence of excitement and inhibition. These games aren't acceptable for guard dogs also because they are based on catching up a runaway person. Therefore, the games may arouse a food-procuring reflex on one side and lower protection activity of a guard dog on the other side. Some dog trainers not only limit, but also forbidden fetch games for guard dogs. 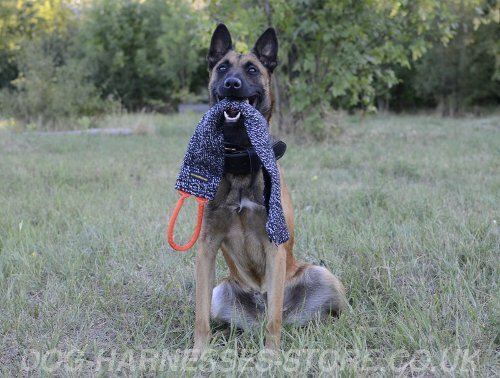 Fetch dog skills are trained together with commands "Hold" – "Come" – "Give". 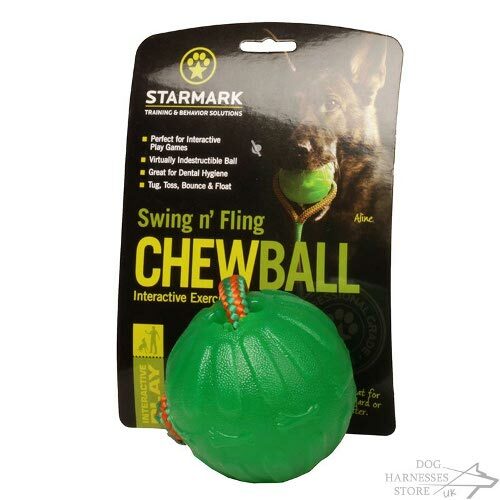 There are also fetch dog games with curing time, pause length changing and with solid rubber ball for dogs throwing around and at various distances for dynamic behavior correction. The exercise running may also depend on your voice. 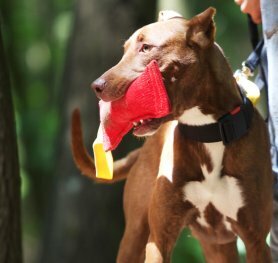 It's useful also to vary the commands "Fetch" and "Play" when the dog may not to give the toy to the trainer. The dog's ability to control its excitement is trained with the help of "switching". When you see that the dog is too excited during the game, give a command "Sit" ("Down" - for the dogs with inflated self-concept). You may hold the dog with your hand if necessary, but you have to train the dog to run the command on its own. The time of inhibition is gradually increased, especially in first 5-30 seconds. Increasing of the excitement, when the dog should run an inhibiting command, is trained at the second stage. The most useful tools for dog games, click on the pictures! 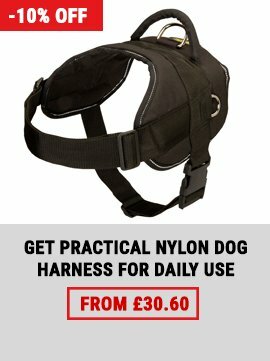 Learn also about play training with your puppy.